War Created a Water Crisis in Mosul. Here’s How We Can Solve It. In Mosul, ISIS sabotaged the water supply, pumping contaminated water into homes all over the city. Then airstrikes targeting ISIS destroyed the pipes that carried water to families. For months, no tap water had been available. Now IHAO/PLC is in the middle of repairing eight sections of water piping in Mosul neighborhoods. This will restore water to up to 1.6 million people. Imagine ISIS rolls into your city and sabotages your water supply. For years, you have nothing to drink but dirty, contaminated water. Eventually, bombs start falling from the sky. They are meant for ISIS—but they also blow huge craters in the street, destroying the water pipes beneath. Now, you don’t have any water—dirty or otherwise. Families in Mosul have endured a years-long water crisis. It’s hard to imagine, with the mighty Tigris River running through the heart of the city. But this is not your typical water crisis. It was caused entirely by human hands. When ISIS took control in 2014, they pumped water into homes without filtration, without purification. Reports started pouring out of Mosul that people were being poisoned by the water they drank. The price of bottled water skyrocketed as roads into Mosul were blockaded. Some families tried digging in their yards, hoping to strike a well deep underground. Others tried collecting rainwater—but Mosul only gets around 14 inches per year. There are entire months without rainfall. Then the battle to liberate Mosul began. Airstrikes pounded the city, wreaking more havoc on the water system and, in many areas, cutting it off completely. As we’ve driven through Mosul neighborhoods, delivering food and opening medical clinics, we’ve seen craters everywhere—pipes that once carried water into homes, now broken and exposed. Useless. When we say violence unmakes the world, it is no metaphor. Today, many Mosul neighborhoods are free from ISIS rule—but they’re still without water. We’ve seen dozens of people crowd around a single hose outside a mosque to fill large containers of water. Young children then have to carry these heavy jugs home to their families. Government authorities and other aid organizations are currently trucking in water from miles away—but it’s not nearly enough to meet the need, and it’s not a long-term solution. 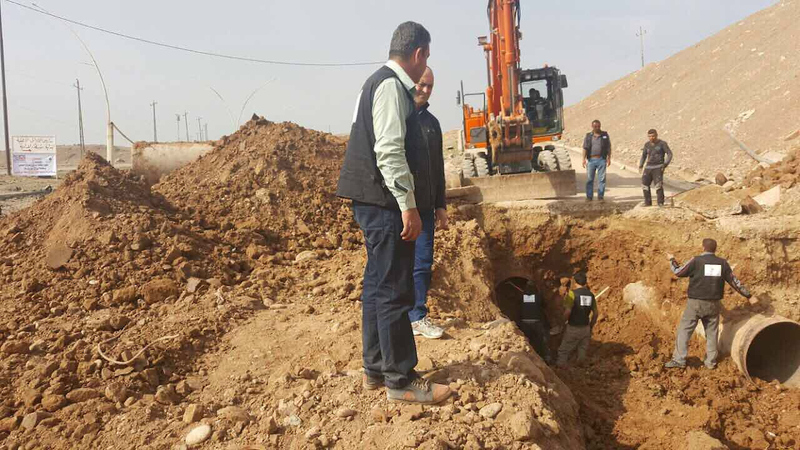 We’re repairing hundreds of feet of pipe in Mosul, so we can turn the water back on for entire neighborhoods. When we’re done, up to 1.6 million people will have clean water again. In terms of how many people we’ll impact, it’s the biggest single project we’ve undertaken so far. And for many in Mosul, water is the greatest single need. Water is life. Water changes everything. It changes whether families have what they need to be healthy. It changes whether communities can function well. It changes a child’s future. It changes whether medical clinics—like the ones you just opened inside Mosul—can provide the care people need when they’re in the middle of a conflict zone. It will take years to solve the global water crisis, but we can solve Mosul’s water crisis today. We can provide a lifetime of clean water for up to 1.6 million people—for around $0.12 per person. Water—or a lack of it—has been at the center of so much conflict in the Middle East. Providing a lifetime of clean water for whole neighborhoods after years of oppression—this is what looks like to unmake violence. This World Water Day, you can end the water crisis and change the future for up to 1.6 million people. Give now—and provide a lifetime of clean water for families who are just now being liberated from ISIS. Provide clean water to 1.6 million people in Mosul.